Three South Gloucestershire school pupils visited Patchway Police Centre on Monday 17 November to celebrate the success of the ‘Bag it and bin it’ anti-dog fouling campaign. 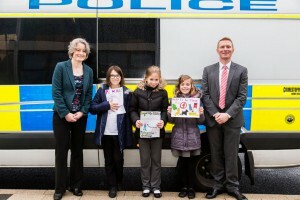 Year 5 pupils Tallulah Kelly and Abi Clemmet from St Chad’s Primary School in Patchway and year 7 pupil Anna Tilsley formerly of St Chad’s, but now of Bradley Stoke Community School, won a competition to design posters to help promote the campaign. They won a visit to the newly opened Patchway Police Centre as a prize, which included a tour of its cells and the opportunity to sit in a police vehicle. The anti-dog fouling initiative promoted the message ‘Bag it and bin it – there is no excuse’ and was piloted in 10 targeted areas throughout Patchway during June, July and August. The campaign ran in partnership with local schools and businesses along with Patchway Town Council, and resulted in a 50 per cent reduction in dog fouling in the area. One of the initiatives was an inter primary school poster competition that was launched during school assemblies, which was won by St Chad’s Primary School. The three winning poster designs will now be adopted by Patchway Town Council who will permanently display them around the area. Communities Chair Cllr Claire Young said: “It’s excellent news that this campaign has proved such a success in encouraging people to do the right thing when out walking their dogs. The campaign message reminds people that they must clear up after their dog, ideally by taking waste home for disposal in their black bin or by disposing of it in any nearby litter bin. The initiative was piloted in Patchway, as it’s an area where we regularly receive complaints about dog fouling, and the town council had expressed an interest in supporting the campaign. A Green Dog Walker group had also recently been re-established in the area, which sees dog walkers wearing green armbands encourage others to pick up after their dogs by handing out bags. Cllr Claire Young, the competition winning pupils Anna Tilsley, Abi Clemmet and Tallulah Kelly, and St Chad’s headteacher Darren Brown.